This still from a CNN broadcast shows North Korea's Unha-3 rocket, as the country officials prepared for an attempted satellite launch in April 2012. North Korea says it will launch a new Unha-3 rocket carrying an Earth-observing satellite into orbit in April 2012 to mark the 100th anniversary of the birth of Kim Il Sung, the country's founder. The launch window ranges between April 12 and April 16. Many nations, including the United States, South Korea and Japan, have condemned the planned launch, which they see as a military missile test in disguise. Video: North Korea Rocket Launch - What Path Will It Take? North Korea officially acknowledged the failure of its latest rocket launch Friday (April 13) in a rare admission from the reclusive nation, which defied international warnings not to launch what the United States and other countries saw as a missile weapons test. A defiant North Korea attempted to launch its new long-range rocket early Friday despite international warnings to stand down, but the vehicle failed to reach space and apparently crashed into the sea, according to press reports. As the world watches and waits to see if North Korea will continue in its bid to launch a long-range rocket despite international warnings, a new video animation reveals just how the space test could occur. facilities, where preparations continue for the imminent, and highly controversial, flight of a long-range rocket. North Korea is launching what it says is a rocket and satellite, but critics call the move a veiled missile launch test. See big questions and answers for the Unha-3 rocket launch. North Korea has reportedly begun fueling its new long-range rocket for what it says is a benign satellite launch, despite continuing condemnation by the United States and other countries, which see the flight as a defiant missile test. The latitude and position of North Korea lead some experts to question whether the country is aiming its satellite for orbit at all. SPACE.com looks at challenge for N. Korea's rocket launch. North Korea's missile launch site is located at Tongchang-ri. 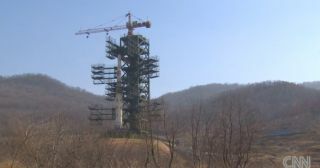 North Korea is proceeding with preparations to launch an Earth-observing satellite into orbit atop a long-range rocket. The controversial launch has been condemned by other nations, including the U.S. and South Korea. North Korea is planning to launch an Earth-observing satellite on a long-range rocket sometime between April 12 and 16. The launch has been condemned by the U.S. and South Korea as a disguise for testing military missiles. As North Korea gears up for a controversial satellite launch next month, here's a brief rundown of the Hermit Kingdom's long-range rockets and missiles. In this still from a CNN broadcast, a North Korean official briefs reporters on the Kawngmyongsong-1 ("Bright Star 1") satellite, which is set to launch atop the country's Unha-3 ("Galaxy-3") rocket to launch in April 2012. North Korea's plans to launch a satellite into space on a long-range rocket has sparked controversy from American and South Korean officials. As North Korea gears up for a controversial satellite launch next month, the capabilities and intent of the secretive nation's space program remain shrouded in mystery. North Korea announced plans to launch a satellite on a long-range rocket next month, according to news reports.